Like this post if Summer's been great so far! Summer is the season of colors! You see eye-popping colors on almost anything, clothes, shoes, accessories, make-up and yes, of course, nails! We've all been there, you know, that situation where you purchase a lacquer that promises so much color but upon application delivers only a washed out version of it's "tube color"... this is why I find it quite tricky to buy polishes because unlike make-up, nail paints aren't convenient to really swatch. Of course you can still swatch a polish before purchase as most nail polish stores have a nail polish remover lying around but it's not convenient because then you'd have to go buy with clean unpolilshed nails, and second, part of a nail polish's quality is it's staying power and clearly, how do you know if a polish can last long if you just swatch and remove it right after? Oh, also, to swatch a polish, you would have to wait for it to dry pa... totally not convenient. Oh, Did you know HBC has this membership/rewards program? You can avail of it by paying membership fee (Php 99) or you can just wait for an accumulated amount and get it free! I love how it rewards you by giving you instant "secret" discounts (check your receipt for this, normally you get member's prices for so much items!" and you also receive points rewards that you can convert to HBC GC later on! Break-out free! Thanks to Etude House AC Clinic Facial Foam Cleanser! 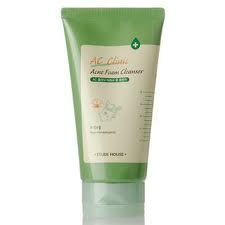 I got AC Clinic Foam cleanser for my sister because she's going through puberty=so frustrated with pimples! Eh, I love her. 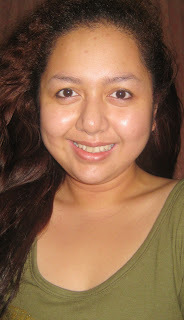 Coincidentally, for some weird reason, I was experiencing breakouts too (though I normally don't!) so I used the product as well and wow, I'm pretty amazed. The best Acne-fighting product I've ever tried! Like this post if you're trying either of the products out!